Kibera, a slum area of Nairobi, currently has over one million people living in an area slightly larger than one square mile. themselves and then dispose them anywhere. 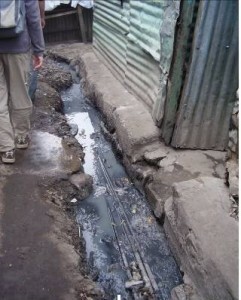 Kibera slum are almost non-existent. open sewers make it worse because the sewage waste flows uncontrollably.